11:35 - Questioners seem to like to hear themselves speak … an unavoidable pitfall it seems … he’s being asked if readers can suggest what they want reviewed … perhaps via an 800 number with a tally … Wasserman quips “you can do that on Amazon” … Diehl quotes Goethe in his defense – consider three things: artist’s intention, how well he did it, and – the key – was it worth doing? Now I’m up and I ask if he concedes he’s had boring dinner guests who he won’t have back, why not kill them before running them – more effective gatekeeping? 11:19 - Second question: What is the role of the review in the cultural life of Los Angeles? Diehl: Treated it as a review for the readers of the L.A. Times ... did not consider it NYRB or NYTRB, which he calls a "trade magazine" ... Was also staggered by NY provincialism ... He started the Westward page two review devoted to L.A. history ... Disagrees with Steve ... in a town like L.A. "every local author deserves a review ... not necessarily a good review ... an honest review ... and there should be room" for such reviews ... He's invoking Kirsch as "accessible" and claims he sought to be the same ... Swipes do not seem veiled at all ... Schwartz is pressing him to be specific about the kind of reader he had in mind ... How is an LA Times reader different from a NY Times reader? .... Diehl thought national and international aspirations were "ridiculous ... ultimately the L.A. Times failed in San Diego!" ... He suggests his public embraces academics, intellectuals as well as the "Balzac of her time" Jacqueline Susann - "I didn't expect her to write like Updike ... wrote stories of her time that entertained people and engaged them in their lives" ... He's oddly admiring of her ... He's bagging on Wasserman for overlong essays that "go on to prove how smart they are ..."
Turan: Your job as editor is to exercise your choice and your taste ... He suggests he always looked for books "that would make interesting reviews" ... for books he could match with a writer to get a good review out of ... not caring so much whether reviewer would like a book or not ...Miles just quips that the old NY story was "if the NY Times got a book about helicopters, they would get a helicopter to review it." 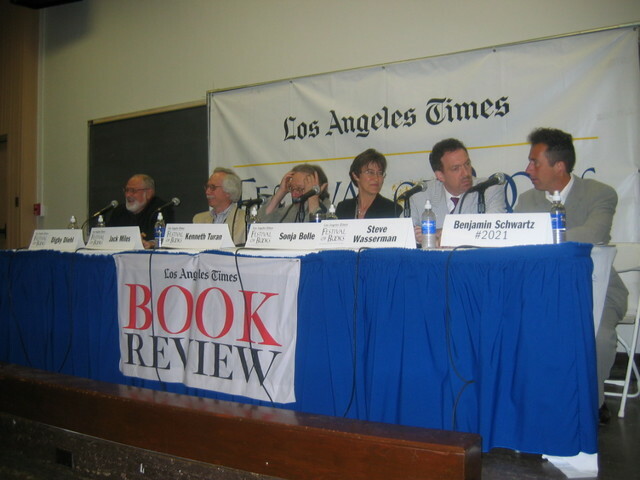 Diehl: Came to LAT in 1969 at behest of Robert Kirsch ... jokes that LAT was best when Kirsch wrote all the reviews himself ... Diehl started as a part timer to write ancilary reviews that "ran around the bra ads" ... suggests that he had no real constraints ... first separate Book Review section ran in December 1969 and became weekly in 1975 ... He's talking about the advertising department which seems a bit inside for this audience ... Schwartz has shoved him along, thankfully. Wasserman: Was deputy editor of Sunday sections from 1977 to 1983 ... Left L.A. for NY to work for FSG and Random House ... 12 or 13 years in NY - he found Manhattanites guilty of "breathtaking provincialism" ... Wow, we actually agree with him on that ... He's talking about NY marketing directors suggesting that people don't read in L.A. ... and rising to the defense of our fair city ... Felt he'd been preparing for the his job his whole adult life ... says he had some idiosyncratic ideas .. wanted to break the "full nelson geography had on Los Angeles" ... and to "drive a wooden stake through the canard" of non-literary L.A. ... As I've said before, this line seems a bit overworked by now, don't you? ... Says he sought out passionate reviewers that would cause readers to remember on Monday what they had read the previous day ... Most papers consign book reviews to "virtual ghettos" ... He wanted to take L.A. readers as "the adults I thought they were ... instead of the baby talk that passes for [book] fare" in so many newspapers ... He believes L.A. has become a world capital with the local having gone global ... He wanted to "break out of the straitjacket of thinking that only the local writers need to be showcased" ... based on advice from Joan Didion ... Joan "reached out a bony hand and gripped my forearm with her nails" ... and said "just review the good books" ... She said do not privilege a writer just because they live in 90210 ... He suggests his critics have assailed him on this ... He just suggested that he is, in fact, pretentious - which he considers the prerequisite of ambition ... Barnes and Noble and Borders are "emporiums of culture" ... Danielle Steel is the "Balzac of our time" (that was a joke, folks) ... Quoting Gordimer ... "authors ought to write as if they were already dead" ... editors "should cleave to such an adage." 10:35 - Prohibitions on drinks in the room now make sense ... my coffee is running down the auditorium floor ... a good start. 10:33 - Mr. W has nodded in my direction upon spotting me here - am a bit hard to miss: front row, tablet PC, satelite connection ... Shall I make faces in his direction? Overheard conversation behind me: "Who's that NY filmmaker ... his last name is Allen?" ... Was not asked ironically. It's a lovely day on campus, sun is shining ... one of the nice things about the Festival is having all these writers in one place and bumping into them ... we just passed our pal Tod Goldberg and his lovely wife Sandy ... we will visit his panel this afternoon. Mr. Wasserman just arrives ... he's wearing a seersucker*, for those of you who follow such things ... More to follow. hi mark. thank god you're bringing it all to us poor folks who can't be there. 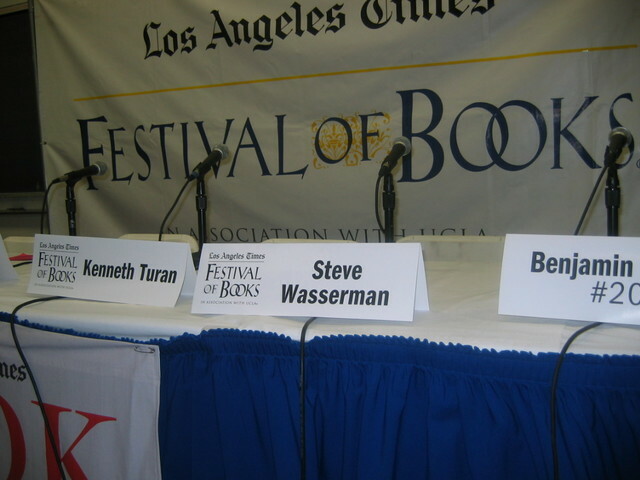 personally, i have no gripes against wasserman...he did publish a nice review of one of my short story collections. now, stop spilling coffee! Yeah, the LA Times is one of the few papers whose environmental coverage has actually improved over the years.